Over 18 different service providers offer easy access to the internet all over Ghana. These providers include BusyInternet, Africanus.net and Africa Online. Over 2,900,000 of the Facebook users live in Ghana. As of 2016, 28.4 percent of the Ghana population had access to the internet, opposed to a mere 0.2 percent in 2000. The number of 7,958,675 internet users means that 20,074,700 people still live without internet access in Ghana. An African organization called Developers in Vogue provides a haven for Ghanaian women pursuing the education in the Science, Technology, Engineering and Mathematics (STEM) fields. Women make up over 50 percent of the population in Africa but less than 20 percent of the science and engineering world in Africa. Developers in Vogue combats gender preconceptions on one level and lack of opportunity on another. Providing scholarships, training courses and a project-based curriculum for women seeking a STEM career, Developers in Vogue connects students with internship and jobs. Their aim is to inspire social impact through technology and problem-solving by using real-life cases from their communities in their curriculum. Another company, Hopin Academy in Tamale, Ghana, works toward supporting students by connecting them to the courses most appropriate for their interests and skills. Through peer-to-peer development and local innovators, the tech hub connects Ghanaians from different backgrounds to practical niches in the local job market. One of the school’s students, Mercy Hammond, is studying BA in Development Education and had her secondary education at Aburi Girls’ Senior High School in the Eastern Region. She is the owner and director of Sparkle House Enterprise that was registered on June 28, 2017, and is involved in the production of jewelry made of both beads and soft metals. As Christoph Fitih, Sales Director for Africa branch of Parallel Wireless states, African countries need to adopt new technologies to prevent further marginalization of Africa from the world economy and eliminate the widening of the current digital divide between Africa and the rest of the world. Businesses in Ghana understand the time is ripe to create an online presence and even necessary as the world market starts to move more and more toward internet users. MEST, a Pan-African organization partnering with global tech giants, offers aspiring entrepreneurs a rigorous, fully sponsored 12-month program to top-graduates in several African countries including Ghana. Training includes business, communications and software development as well as hands-on project work, giving graduates the chance to pitch their final idea to the board and receive seed funding for their entrepreneurship. Academics and teachers from all over the world bring their experience to the company. More internet coverage in Ghana means tech companies such as Hubtel and Rancard have become Pan-African brands and according to Nana Prempeh, co-founder and CEO of Asoriba, Ghana has great strengths when it comes to the tech ecosystem. MEST has been a strong backbone of the community. Other global companies partnering with Ghana’s many startups and tech hubs include Google, Amazon Web Services and Microsoft, all connected through MEST. Ghana’s comparatively stable electricity, security and internet infrastructure exists despite the series of damaging military coups the country went through before 1981. Even though fewer than 1 percent of African retail sales happen online, e-commerce will sky-rocket in Africa, according to the technology review Ghana’s Last Mile by Jonathan Rosen. He hopes issues with unpaved roads and confusing street-labeling will soon be solved through the same spirit of innovation that is already sweeping the nation. Broader internet coverage in Ghana brightens its future in tech and the online market. There are obstacles of infrastructure to overcome and yet great hope for keeping up with world-wide tech hubs remains. Perhaps the country’s name, roughly derived from the words meaning Warrior King, gives a glimpse of the spirit of the country. Investment from giants like Google and Amazon Web Services spearhead the beginning of partnerships with corporations all over the globe, as other companies begin to take notice of Ghana’s local hubs and competitive training. Most encouraging is seeing the hands-on training of MEST addressing communities and providing a stream of trained tech-students into the job market. Education in Ghana has seen a rise in terms of enrollment. However, there are still issues that must be addressed in regards to girls’ education in Ghana, that the country’s government, the U.S. and the rest of the world aim to resolve and rectify. In the article below, top 10 facts about girls’ education in Ghana are presented. On average, girls in Ghana stay in school for only four years, dropping out as a result of early marriage, pregnancy, poverty, sexual harassment and various other barriers. Adolescent pregnancy statistics from 2017 show that 14 percent of girls in Ghana aged from 15 from 19 have at least one child. Almost 52 percent of girls have endured gender-based violence whilst at school, that has deterred them from attending the school. In 2017, the gross ratio of female enrollment in tertiary education was 13.53 percent in comparison to 18.68 percent for boys. This shows that there are still significant improvements that need to be made in order to increase enrollment rates for girls in Ghana. There are many reasons why girls in Ghana miss out on their education, and one of these reasons is something they cannot prevent and have no control over, which is their menstrual cycle. Currently, sanitary pads are seen as a luxury as they are taxed by import charge of 20 percent. As a result, many girls often skip school during their menstrual cycle, as they do not have the materials to leave their house without feeling a sense of humility or shame. There are currently various petitions regarding the extortionate tax on sanitary pads since they affect the everyday lives of young women attempting to further their career through education. Many Ghanaian girls have experienced sexual violence during their time at school. According to ActionAid, 26 percent of girls in the country’s schools have reported sexual violence during their education. In July 2018, 10 female students reported sexual violence against eight teachers at a high school in Ghana, with only four being indicted for their crimes. In order to combat gender-driven violence in schools, Oxfam and the Ghana Education Service partnered up in 2008 to implement girls-only schools that were funded by local authorities. The first girls-only school was a junior high school in the northern province of Sawla, where 28 girls were enrolled from some of the poorest families in the region. The girls-only schools have expanded since, and more than a decade later, in March 2018, there were 44 schools in northern Ghana. The girls model schools have improved both safety in schools, as well as career prospects for more than 1,642 Ghanaian girls, out of which 95 percent graduated, with the majority continuing on to higher education. New styles of teaching are being implemented in girls-only schools in Ghana, which were previously inaccessible due to the lack of funding needed for teacher training. The changes include implementing computing, as well as more student-centered methods, which enable girls to reflect on their learning experiences during study groups. Since the groups are smaller, there is a better focus on the individual students, which improves their education as a whole. According to 2016 statistics from The Gender Parity Index (GPI), a significant increase in disparity between boys’ and girls’ education has been recorded. It now stands at a GPI of 0.997. This means Ghana has managed to somewhat eliminate gender disparity since 1971 when this index was 0.764. Disparity should continue to decrease, as more efforts are being made to make education inclusive for everyone. Since 1995, primary and junior high schools have been freely available to all children in Ghana, and in September 2017, Ghana’s President Nano Akufo-Addo announced the launch of cost-free secondary education as an investment that aims to improve workforce prospects in Ghana. The estimated expenditure for the first year of this initiative was $100 million, which the government will be using to pay for textbooks, meals, tuition, uniforms and various other school expenses. In April 2018, A2Z Firm Movement, a nongovernmental organization launched their Protect Girls’ Rights Campaign that is expected to run from 2018 to 2025. The aim of the campaign is to educate teenage mothers by encouraging them to take part in entrepreneurship activities under the girls’ rights support club. This not only provides them with an education but also the ability to an escape from the poverty they are currently facing. In October 2018, former first lady of the United States., Michelle Obama, launched Global Girls Alliance, a girl’s education program that aims to improve the education of adolescent girls. The program does this by offering the necessary resources and encouraging young people all over the world to work alongside girl-focused organizations, who can help create a brighter future for girls through focusing on better education. In 1998, the food aid incentive collaboration launched by The World Food Programme (WFP) and the Ghana Education Service. This initiative has been providing the necessary food for girls in education. Currently, the program has 17,000 girls enrolled in schools around Ghana, as a result of the food incentives that were introduced to address gender parity gaps. These top 10 facts about girls’ education in Ghana have established both the positives and negatives regarding the school system in Ghana. Although the improvements have been made to improve the girls’ education in the country, there is still room for improvement. There are many initiatives and projects in place that help girls in Ghana get the best education they deserve. Situated in West Africa, Ghana is a developing African nation steeped in various cultures and tradition that date far back in history. Ghana faces many of the problems common amongst developing countries including lack of natural resources and a majority of the population that is living in poverty. In the article below, top 10 facts about living conditions in Ghana are presented. 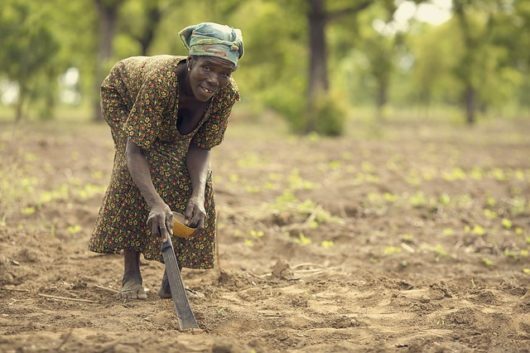 People in Ghana rely on farming for survival. The country has a population of 25.37 million, and these people are distributed throughout the country’s 10 regions. Out of this number, 68 percent of people live in rural areas whilst the rest occupies the more urban areas. Agriculture accounts for 54 percent of the country’s GDP and for more than 40 percent of income brought in by exports. The country also relies on their agriculture as a major food source which caters for more than 90 percent of the people’s needs. The dry season in Ghana lasts for four months of the year and in that time, rain ceases to fall and plant growth is therefore limited. Farmers mostly choose not to farm at this time and would rather rely on food they would have stored from the previous harvest. People in Ghana are steeped in their culture and most of them would rather live in the village than in the towns. The main reasons for moving to towns is to find work and people usually stay strongly linked to their villages of origin. However, life in rural Ghana is quite primitive and there is a scarcity of running water and electricity. People still have to go and fetch water in clay pots from the nearest water source. In most of rural Ghana, the young girls have to wake up early in the morning before school to go to the nearest river to collect water. The nearest river can sometimes be 30 minutes away and the water collection process has to be done at least four times a day. Keshia, a Peace Corps volunteer, found a program funded by the U.S. foundation for African Development through a Ghanaian organization called New Energy. It was initiated in a neighboring community and involved a solar-powered filtration unit which provided clean, filtered water. Keshia spoke to New Energy and convinced them to extend the range of the filtered water to the village she was helping. The result is that water now runs in two kilometers long pipes and is reserved in two 10,000 liter tanks. In a northern region village, the farmers are faced with the challenge of fetching water, making three trips to water one bed in their 20-bed garden plots. The farmers dug wells as a source of water in dry months. Consequently, the task takes two entire days to complete and the men have to sleep overnight at their gardens in order to get the work done. In another Ghanaian village, there is no cell service and no electricity and the people have to get creative with their means of making a living. With the help of a volunteer, Joe, the villagers tried bee-keeping, palm oil distribution and a moringa project which was the most successful. The moringa leaf can be turned into a powder that fits a growing niche in the U.S. natural and green food market. Urban Ghana appears to be a much more conducive living environment. There is clean water for 93 percent of the population living in the towns compared to rural areas where only 35 percent of the people have access to clean drinking water. This fact comes as no surprise especially as most villages still rely on the water in nearby rivers. Although different organizations are working in various communities to help the issue, they cannot impact everyone at once and as a result, there are many villages still living without clean water. Infants and children born in towns are more likely to survive and live a full life than those who live in the villages. There are better medical facilities in the towns that are easily accessible. In comparison, two villages usually share one clinic. Because of the distance and expenses, villagers hardly ever go to the hospital and would rather rely on medical salesmen who sell antibiotics and painkillers on a bicycle to provide medication when they or loved ones are ill. In the villages, there is far less opportunity for an education and the curriculum is limited with available resources. In urban villages and towns, there are several teachers, concrete school buildings with roofs, desks and chairs. In the rural areas, one or two teachers have to teach in tumble-down huts and leaking thatched roofs. Children have to walk large distances to get to classes that only last a couple of hours and they usually finish only primary education. Only about two-thirds of people in Ghana are literate. While life in Ghana may seem tough, the continuous work is being done to improve the situation. The organizations such as Peace Corps and U.S. Aid are active in the country and are trying to better the communities. While the people of Ghana enjoy their rural lifestyle, these top 10 facts about Ghana presented above show that this has to change in order for education and poverty reduction to improve. Ghana is an African country located on West Africa’s Gulf of Guinea. Youth education in Ghana has been steadily improving in recent years thanks to government programs that have helped improve the education sector. The education sector in Ghana has seen improvements in a number of educational levels. Primary school completion rates have raised from 80 percent of the total population in 2008 to close to 100 percent in 2016. The out-of-school rate for children in primary school has fallen from 25 percent of the population in 2008 to 15 percent of the population in 2016. The amount of teachers trained for primary and secondary school has also risen by 5 percent in this time span. While these improvements are certainly noteworthy, there is still much work to be done. Nearly 623,500 children are not enrolled in primary school and one out of four children are not enrolled in preschool. It is also estimated that 20 percent of children with physical disabilities are not attending schools. Schools in Ghana operate on a 6-3-4-4 system. This means that the education is consisted out of six years of primary school, three years of junior high school, four years of senior high school and four years for a university bachelor’s degree. Admission to the senior secondary school is fairly competitive, allowing only for 150,000 students to admittance to the 500 public and 200 private national secondary schools. Ghanaian students may also enroll in public boarding schools for senior secondary education, but there are only a half dozen international private secondary schools in the country that have around 300 student graduates on a yearly basis. The curriculum for public national schools includes English Language, Integrated Science, Mathematics and Social Studies. Students also take three or four electives chosen from seven categories: Sciences, Arts, Vocational (visual arts or home economics), Technical, Business and Agriculture. After finishing senior secondary school, students take the West African Senior Secondary Certificate Examination (WASSCE). The exam is difficult, with only 4 percent of students receiving A’s. The Government of Ghana is currently in the process of finalizing the new Education Strategic Plan 2018-2030, with the goal of ensuring education plays a large role in the national development agenda. The main priorities of the program include allowing equal opportunities for accessing education in a conducive environment, achieving a high level of educational standards across all age groups, more relevant instructional model that will allow education and skills to be taught depending on community and individual needs and finally more efficient management of resources that will focus on low wastage of money in achieving goals and ensuring a sustainable balance of continual development of the education system. Improving educational standards is a very important factor in the strategic plan. Overcrowding in classrooms, low access to clean water and a shortage of reading material are obstacles to a successful learning environment. The system will look to address some of the underlying educational issues in Ghana, such as enticing students to return to school after dropping out and improving early grade education. These problems are directly correlated with the youth of Ghana and it can help them break the cycle of poverty. Youth education in Ghana is an important factor in eradicating poverty in the country. Knowing that education can be the key to improving the living standard of the citizens, the government has taken and plans to implement different programs to educate its population. The population of Ghana has exploded over the past couple decades, which has dramatically reduced the poverty rate throughout this West African country. Between 1991 and 2013, the poverty rate plummeted from 37.6 percent to 9.6 percent. However, poverty is still considered a big issue, which has led to the March for Science to end poverty in Ghana. What was the March for Science? In order to combat the issue of poverty in their country, Ghanaian scientists and science-loving Ghanaians stepped out on Saturday, April 14th, 2018 to protest the lack of funding for science and technology research. The march was led by scientists from Alliance for Science Ghana, and the marchers participated in an 8k walk on the streets of their capital, Accra, and later they came together for a forum to talk about the role of science in national development. What was the Main Objective for this March? The theme for this march was “Building Ghana: Let’s end environmental destruction and poverty through science informed actions.” The reason for theme being that Ghanaians wanted to get the point across that poverty in Ghana will not be abolished without science and technology research funding becoming a priority to governmental leaders. This march was also needed in order to inform the greater public about the fact that there is a direct link between protecting the environment from ruin and eliminating poverty. It is evident that the lack of precedence science and technology in Ghana holds in the government directly impacts poverty in this country. One of the aims of the Accra March for Science is to bring this issue to the attention of government officials. What is Science and Technology Research Like in Ghana Today? Currently, funding for scientific research in Ghana is at a scarce 0.2 percent per year. In order for this country to try and get out of its poverty cycle, this amount must increase to 3.5 percent every year, as is the United Nation’s goal. The United Nations has said that increased investment in science and technology is a crucial aspect of breaking the cycle of poverty, and Ghana needs to listen and use this advice to its advantage. How Does This Lack of Research Funding Affect Farmers? There are scientific improvements being made in Ghana with the limited amount of funding that is provided, but this technology often does not reach farmers because of the inadequate extension services and the lack of investments in agriculture and regulatory procedures. Such issues need to be fixed. With an increase in funding for science and technology research, there will be means to address the gap between the science and agriculture communities of Ghana. The government needs to put in the effort of extending support to farmers in order to ensure food security to the Ghanaian people, as well as to help pull Ghana out of poverty. A recent research study at the University of Ghana revealed that more than 80 percent of smallholder farmers are not benefitting from the government’s support. The hope of this march is that advocating for the increase in funding to science and technology research can also help end poverty in Ghana by way of reaching the Ghanian farmers. This impoverished West African country would benefit enormously if the government paid attention to the areas in need. Science and technology research funding needs to be increased dramatically to both reach farmers and help break the cycle of poverty in this country. In a monumental accomplishment, Ghana has triumphed in its Millenium Development Goal of cutting poverty within the nation in half. In the 1990s, half the population was subject to living standards below the poverty line, but by 2013 this figure was down to less than a quarter. The country now gears up for the U.N.’s first Sustainable Development Goal of completely ending poverty in Ghana. With this new goal in mind, Ghana is challenged to address the lagging segment of the population and stimulate growth and greater equality. From 2007 to 2016, Ghana managed to stimulate economic growth at a rate above 7 percent. However, the agricultural industry only grew by 3.5 percent, lagging much behind the economy. In fact, the African Development Bank reported that Ghana’s agricultural sector would need to achieve a 7 percent growth in order to initiate poverty reduction. The reason agriculture is a crucial area of improvement to end poverty in Ghana is that more than half of its population works in this industry. Over 90 percent of employment in rural areas is based in agriculture, and these areas also comprise the poorest of the poor in the entire country. Ghana faces other challenges in infrastructure that hinder economic growth and poverty alleviation; however, the U.N. Development Program supported Ghana in its transition to greater infrastructure in a sustainable way. Energy, for instance, appears to be one of the key focus areas for infrastructure improvement. The U.N. provided adaptation and mitigation strategies in Ghana’s development policies and programs. Moreover, this cooperation between the U.N. and Ghana also contributed to Ghana’s mission to diversify energy sources, greatly incorporate renewable energy and develop more efficient energy. Ghana has advanced and grown significantly over the past two decades; poverty is cut by more than a half of what it was before the turn of the century. Ghana stands as one of the few countries that achieved the Millennium Development Goal. Fortunately, there are numerous strategies, focus areas and initiatives occurring today to end poverty in Ghana once and for all. In the last two decades, poverty in Ghana has drastically reduced due to an increase in economic factors, despite poverty still dominating more rural areas where there is not enough access to food and other basic necessities. Between the years 1991 and 2012, the poverty rate in Ghana has been cut by more than half, from 52 percent to 21 percent. In 2011, the country was considered to have a middle-class economy. Ghana accomplished such status by obtaining a more skilled labor force and geographical mobility. Despite the booming economic growth, poverty in Ghana is still prevalent. Poverty has shifted from urban areas to now more rural areas of the country; in fact, rural poverty is almost four times higher than urban poverty. According to UNICEF, the poverty reduction rate has declined in recent years. There is only a 1.1 percent reduction rate per year since 2006. The northern region of the country makes up the largest number of citizens in poverty in Ghana. Since the 1990s, the poverty rate in the northern region has dropped from 55 percent to 50 percent. In Ghana, children are 40 percent more likely to live in poverty than adults. UNICEF states that 1.2 million households are unable to supply an adequate amount of food for their children. Overcrowding and homelessness are some of the many reasons for poverty in Ghana. According to Habitat for Humanity, many houses in the country lack ventilation and basic amenities. In more rural areas, outbreaks of cholera are common from lack of inside toilets in homes. Using the bathroom outside or in public pits contributes to the passing of hazardous diseases. The World Food Program reports that twenty-seven percent of households are at risk of hunger in Ghana. About a third of the population is living on less than $1.25 a day, which means obtaining food is extremely difficult. In 2006, infant mortality rates were cut by half, although healthcare is still poor in the country. The northern regions only have nine percent of hospitals even though it holds a majority of the population. Citizens in the northern region of Ghana have to travel far distances to reach hospitals and travel costs can be high. Ghana is continuing to grow despite its problems with poverty. In fact, the nation is considered to have one of the world’s fastest growing economies in the world. At the end of 2017, the economy increased for the fifth successive quarter. The economy has increasingly focused on agricultural growth, which has created more jobs. Ghana’s government has also been spending money on educating workers that in return will create more money for the country. One of Ghana’s greatest challenges for the future is spreading development evenly throughout the country, and one can only wish Ghana success in combating such an issue.